Of all the shoes in our collections, a special mention must be made for Chelsea boots. Boots become an absolute outfit staple through not only winter but also during those trickier transitional autumn and spring months. And Chelsea boots certainly take the top spot when it comes to comfort, versatility and style. From casual days spent with friends to bigger evenings out, Chelsea boots are a must for any style-savvy lady. If you’re wondering exactly how to wear your ladies Chelsea boots, look no further. Here at Moda in Pelle, we’ve picked a handful of our favourite Chelsea boots styles, detailing how you can wear them to make an impression on any occasion. On those chilled out days off, comfort is key. You’re relaxing around the house, in your snuggest oversized knitwear and cosy leggings, and you need to pop out: you want to remain comfortable, but still look well put together. In these scenarios, Chelsea boots are your best friend! One versatile, comfortable pair of Chelsea boots are an absolute wardrobe go-to, bringing an effortlessly chic edge to any look. The Callio Tan Leather Chelsea boots, with their classic style and sophisticated brogue detailing, are guaranteed to bring a refined touch to any lazy day look. Whether you have a big job interview on the horizon or you’re simply looking to step up your day-to-day look around the office, Chelsea boots are a great choice. Try teaming a sleek polo neck shirt with slightly cropped cigarette pants and a tailored blazer. Then, to finish the look, add a low heeled Chelsea boot. Look for subtle colours or patterns to bring a touch of style to your look while keeping it appropriate for the workplace. 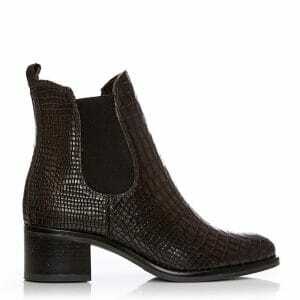 Our number one choice for the workplace is the gorgeous Colino Dark Brown Mocc Croc Chelsea boots. Sleek and sophisticated yet with an eye-catching crocodile skin design, these boots will give flair to your workplace ensemble without detracting from your professionalism. Perhaps you’re lucky enough to be jetting off on a city break early this year? If so, you need footwear that is practical and comfortable enough to withstand all the exploring you’ll be doing. Chelsea boots tick all the boxes here. Create a sophisticated European look and fit in with the locals with black skinny jeans, a structured coat and a pair of classic black leather Chelsea boots. The Ablist Black Leather boots are ideal for days spent exploring new places. The high-quality leather both looks and feels fantastic, while the practical flat style will ensure day-long comfort. For the ultimate fashionable finish, complete your look with a pair of dark sunglasses. Are you heading out with friends and looking to create the perfect look? Chelsea boots are a great versatile choice to finish a whole host of daily looks. Try teaming together fashionable mom jeans with a jacket and cosy scarf, then adding a slightly edgier boot to give your look a twist. Patterned ankle boots or colourful options are ideal here – they are fun and fashionable, but still casual and comfortable enough for day-to-day. 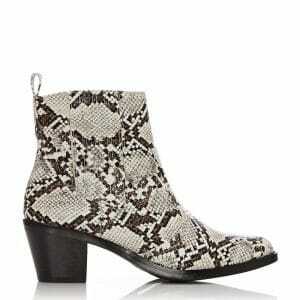 If fun and fashionable is what you’re looking for, look no further than the gorgeous Marian Monochrome Snake Print boots. With a statement snake pattern and a block heel to elevate your look, these ankle Chelsea boots are sure to turn heads wherever you go. Finally, how about those cocktail evenings or big nights out with the girls? While we all know the power of a stiletto heel, sometimes we just want something that little bit more practical. Perhaps you’re heading out for afternoon-into-evening drinks, and don’t want sore feet by 9 pm? 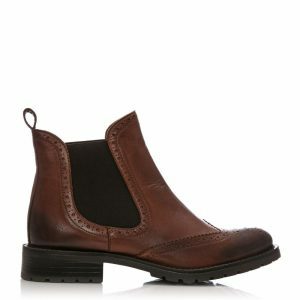 Or perhaps you simply understand the power of a good heeled Chelsea boot! Teamed with a statement dress and an effortlessly cool leather jacket, a pair of heeled boots provide the ideal companion to an evening out. 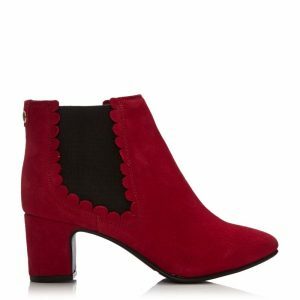 The Lotis Red Suede ankle boots are our top pick for an evening out. The block heel adds height to your look without being uncomfortable, while the beautiful rich red shade will pair perfectly with an equally striking red lip. So, are you ready to join the Chelsea boot revolution? 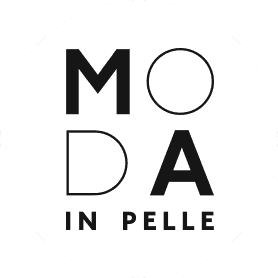 If so, why not explore the full Chelsea boots collection at Moda in Pelle? From sassy block heeled Chelsea boots to sophisticated flat options, you’re sure to find a pair to fall head over heels in love with. We've been crafting beautiful shoes for over 40 years, combining British sophistication with fine Italian quality and gorgeous leathers. Be inspired by our stunning styles, and find out the best way to wear your new shoes!